The Family Medicine Certification process provided by the American Board of Family Medicine (ABFM) is the means by which the ABFM continually assesses Diplomates. The ABFM’s long-standing recertification program, the ABFM Family Medicine Certification process stresses the importance of ongoing participation in activities that evaluate each of these components between certification examinations. ABFM Family Medicine Certification is a required process that the ABFM believes encourages clinical excellence and benefits both physicians and their patients. 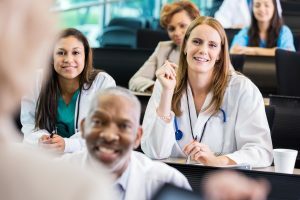 In the ABFM Family Medicine Certification program, each certified Diplomate must successfully complete a series of Certification activities in separate 3-year windows, called “stages.” Completing these requirements in a timely manner allows the Diplomate to maintain his or her certification status. Those Diplomates last certified between 2003-2010 had the option to maintain a 7-year certificate or gain a 10-year certificate. Those physicians that chose to maintain a 7-year certificate participate in required Certification activities throughout the 7-year cycle. Visit this link for additional detailed information.